Strike a pose, it's . . . The Vintage Village John French Fair! How much: £2 entry, £1.50 concessions, under 12s FREE! 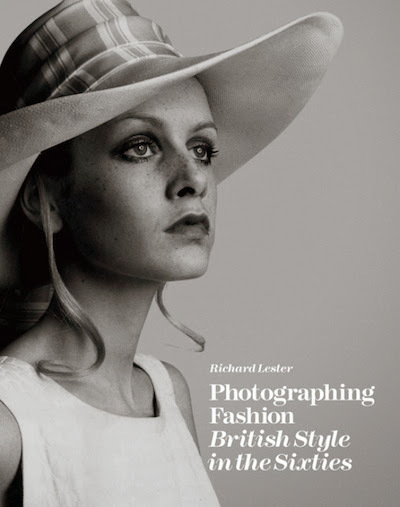 ★ Pioneered a new form of fashion photography in Britain in the early 1950s that was sharp enough for the dingy limitations of newsprint, using natural light. ★ Was reputedly the first to employ the bulldog clip as a styling accessory, nipping in garments for a clean, sculpted silhouette. 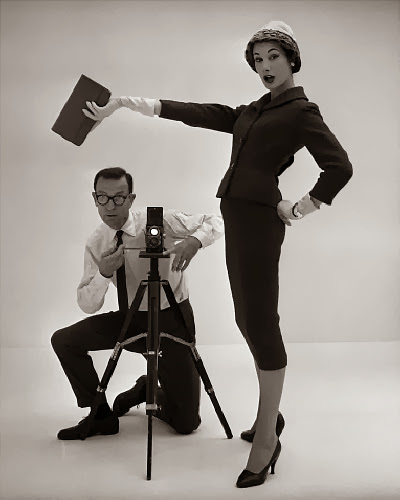 ★ Gave both David Bailey and Terence Donovan their first jobs in fashion photography, actively encouraging the new generation who would soon make his elegant finesse look distinctly out of date. 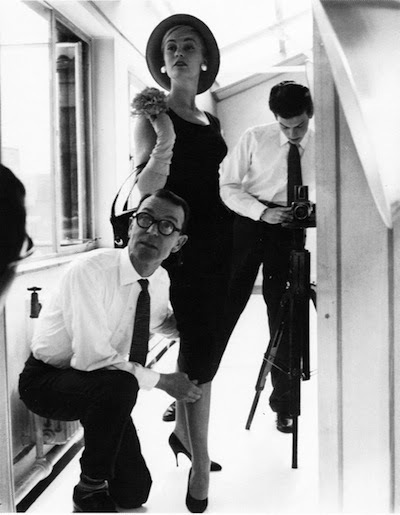 ★ Reportedly never released the shutter on his photographs, preferring to direct, frame and style each shot and leave that tiresome duty to his assistants. Mr John French should be a household name - just take a look at the alluring photos on this page - and it's his birthday on 1st March, so we're taking the opportunity to celebrate him and his super stylish legacy. Suggested dress code: 1950s - early 1960s, and/or just dress in monochrome! 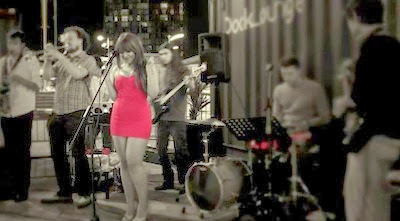 ★ Lucy Mae & the Tom Cats are playing live! Here's your chance to enjoy a modern soul singer/songwriter - inspired by icons such as Etta James, Aretha Franklin and Nat King Cole - and a red-hot young band behind her! ★ We have a FREE RAFFLE! - every paid admission will receive a free raffle ticket from opening time to 2.00pm. Draw at 2.30pm. Please leave your ticket number and contact details at the door if you can't stay for the draw. See the photos on the right for the three wonderful prizes on offer. And not forgetting the full-to-capacity Covered Market Hall, heaving with authentic vintage clothing and accessories for ladies and gents, jewellery, homeware, decor, furniture, luggage, textiles, collectables, curiosities and judiciously selected locally handmade crafts with a vintage flavour. If you need to refuel after some hectic quality vintage browsing, we have the magnificent Lord of the Pies, the marvellous Honest Crust Pizza, the majestic Kandoo Mobile Coffee and the miraculous Stuart Thornley Cake Design. Menus ahoy! After much last-minute shenanigans, here is our just about definitive list of top quality traders who will be cluttering up the Covered Market Hall with all kinds of marvellousness! Andy's Antiques - military clothing, homeware 1930s-80s. Big on Retro - mid-century modern homeware, ceramics, small furniture; handmade cushions and lampshades using vintage fabric. Black Cat Vintage - vintage clothing, accessories, homeware. NEW! Blythe House Hospice - vintage clothing, accessories and homeware, all proceeds go to their charity. Eclectique Chic - vintage women's clothing, accessories, jewellery, and some homeware. Essentially Eagle - vintage clothing, accessories and homeware, 1930s-80s. NEW! Gemma Harrison - women's vintage clothing and accessories, 1960s-80s; some mid-century homeware. NEW! It's Sew Lisa - homeware, collectables, textiles. Jackal Threads - classic men's clothing, 1940s-80s. Kitsch Republic - vintage, recycled and handmade homeware. Lace and Liquor Vintage - women's vintage clothing and accessories; homeware, kitchenalia and bric-a-brac, 1940s-70s. NEW! Lime Street Trading - vintage furniture, trunks and luggage, homeware, clothing. Munkispanner - handmade Mod clothing using original fabric and trims, and original vintage for men and women, 1960s-70s. NEW! Ola Vintage - vintage men's and women's clothing and accessories. One of a Kind - vintage women's and mens clothing, accessories and more. Penelope Cat Vintage - children's books, including Ladybirds, Puffin, Enid Blyton, 1920s-80s; homeware including Pyrex, ceramics and glass, 1930s-70s. Sarah's Second Chance - vintage homeware and accessories. suzylovesmilo - women's vintage clothing and accessories, homeware, ceramics; upcycled vintage clothing and accessories. NEW! The Art of Time - vintage watches, cameras, lighters and fountain pens, 1930s-70s. NEW! The Font Archive - original, hand-rendered letter forms salvaged from an Altrincham linotype foundry, 1900s-70s. NEW! Two Tone Retro - vintage furniture and homeware, 1930s-80s. We Used To Have One Of Those - vintage photographic and audio visual equipment, early to mid century homeware, books, ephemera, comics, toys and games. Barbara Goalen in the tube, 1954. Photo by John French. Source. John French and Daphne Abrams in a tailored suit, for the TV Times, 1950s. You could win a framed print of this photo in our FREE RAFFLE! Lucy Mae & The Tom Cats will be playing LIVE! 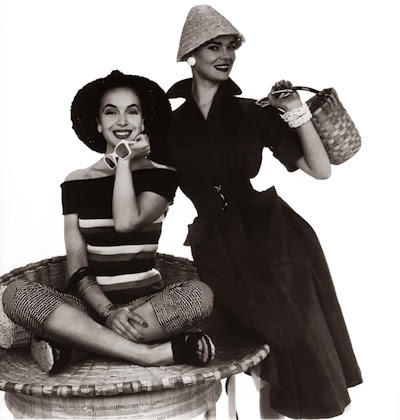 Summer ensembles modelled by Marla Scarafia and Susan Abraham for Vanity Fair, 1954. Photo by John French. Source. 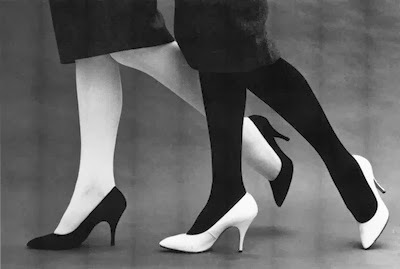 Monochrome legs, photo by John French. Source. 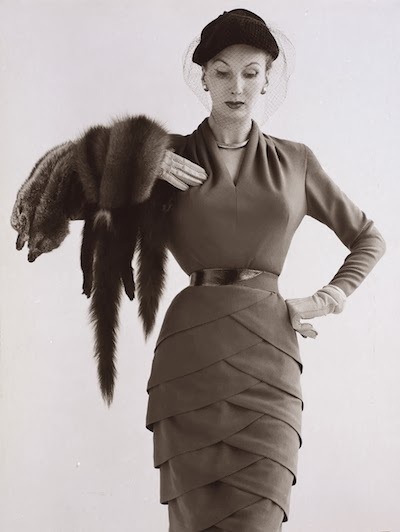 Barbara Goalen in an incredible Lily Schroter woolen day dress, 1951. Photo by John French. Source. Perching on a 60s icon - the mini! Photo by John French. Source. Geometric patterns projected onto a model, 1960s. Photo by John French. Source. You could win a print of this in our FREE RAFFLE! Is that John French's hand - possibly not! A Digby Morton velvet coat trimmed with fur, 1958. Source. The Rolling Stones with Patti Boyd wearing a Quant dress, 1964. Photo by John French. Source. 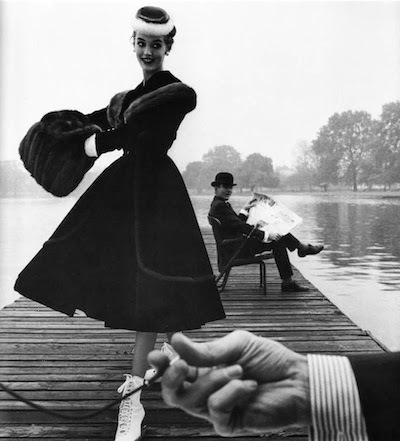 Another shot of John French at work, with model Jean Dawnay, 1958. Typically, it was his assistant who released the shutter. Source. You could win a copy of this fabulous book - featuring John French amongst other luminaries - in our FREE RAFFLE!